The Photo Marketing Association’s PMA 07 convention, which wrapped up Sunday in Las Vegas, didn’t have the excitement of Macworld Expo, but it doesn’t have to: the show is primarily for photo store owners, professional photographers, and people who make their living selling cameras and related services. It’s largely a hardware show, which is why Apple and Adobe weren’t represented on the show floor, but Nikon, Canon, HP, Panasonic, JVC and other vendors were there in force. Since that first version, Lensbabies has been refining and improving their product. 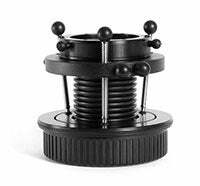 The $150 Lensbaby 2.0, which came out in 2005, added multiple apertures—through an ingenious magnetic mechanism that ‘floats’ a metal aperture disc above the lens—and a glass lens. At PMA, the company was showing the Lensbaby 3G, the “ultimate” model, which offers a locking mechanism, longer focal length (100mm, as opposed to the 50mm length on the older versions), a fine focusing dial and a greater range of apertures. I’ve been using a 3G for a few months now, and it’s quite an impressive piece of equipment. It has a more substantial feel than the Original Lensbaby, less like a toy and more like a professional product. The locking and fine-focus additions make it easy to reproduce the Lensbaby effect, making it an excellent choice for studio photographers. At $270, the Lensbaby 3G isn’t an impulse buy—the lower-end models are fine if you’re just looking to play around—but it really is a great enhancement to a fun line of products. Ben Long and I each tried the Adventure Vest on, loaded it up with a camera and telephoto lenses, and were surprised at how comfortable it was. Even when stuffed to capacity, it felt nowhere near as heavy as a full pack does on my back. The vest is a combination of mesh, neoprene and cordura nylon, and the units we looked at were well-constructed and filled with many thoughtful little details. The flip-down seat is designed to let you rock back in it for support, and it was pretty easy to get in and out of it once you got the hang of it. The seat also doubles as a tripod holder, and you can remove it entirely if you don’t need the bulk. Wearing a photo vest is an acquired taste. I know some folks who swear by them, while others would prefer to look “less dorky” and schlep their stuff on their back. Having used a couple of vests in the field, I know how good they can be, and just a short walk with Adventure Vest made me want to get one. Loren recently found a distributor for the vests, which means that they should become available in camera stores over the coming months (he has a “garage full of them” if you can’t wait). A khaki version of the vest is also on the way, for those who don’t want to spend a day in the sun in a black vest. If you shoot in Raw mode, you can easily perform white balance correction in your image editor of choice, but the ExpoDisc really saves you time and can make your workflow much more efficient, especially if you’re shooting hundreds of pictures. For more info, check out Derrick Story’s primer on the ExpoDisc; he offers a quick tutorial on it, and talks about why it’s so essential to his work. In addition to the line of ExpoDiscs (which are priced from $100 to $125), ExpoImaging was also showing the ExpoAperture Depth of Field Guide, a $30 field tool for helping photographers determine the proper lens aperture for regions of focus in a scene (Wikipedia defines depth of field as “the distance in front of and beyond the subject that appears to be in focus.”). The product is based on a depth of field guide originally created by George Wallace, the grandfather of one of ExpoImaging’s founders, and it has an old-world, “hurry up and slow down” feel to it. I showed it to a couple of photographers who thought it was a great update to the guides they used when they were starting up, while others just gave me a quizzical look. If you know someone who’s getting into photography (digital or film), and is looking for a good instructional guide, it is worth checking ExpoAperture out. For other PMA related news, check out Kelly Turner’s reports on HD-related products announced at the show, Delkin's SensorScope and the MagicPortrait online service.